As you probably know, we don’t believe in Vodka here at Measure and Stir, except for fortifying syrups and disinfecting minor cuts and scrapes. We also don’t believe in Malibu, which is probably the least appetizing thing in the world ever to be labelled rum. Indeed, on account of Mr. West, I now refer to any drink as Malibooya when its chief components are drawn from the following: (Flavored or not) Vodka, Malibu, Midori, Jager, Sour Apple Pucker, Peach Schnapps, low-proof fruit-flavored “liqueurs”, red bull, sprite, and pasteurized orange juice. Even so, I sometimes hear the siren song of coconut rum, whose call I answer by pouring J. Wray and Nephew into a coconut. And yes, I did, in fact, put lime in the coconut, and then I proceeded to “drink it all up”. Though to be honest, even though I adore fresh coconut water, I’m not sold on it as an ingredient for a mixed drink; coconut milk and cream provide a much more rounded and robust coconut flavor, because they incorporate the qualities of the coconut meat, and the richness of its fat, into the drink. Coconut water is so thin that it almost makes this a grog. Drain a fresh young coconut, and measure out just enough coconut water for your drink. 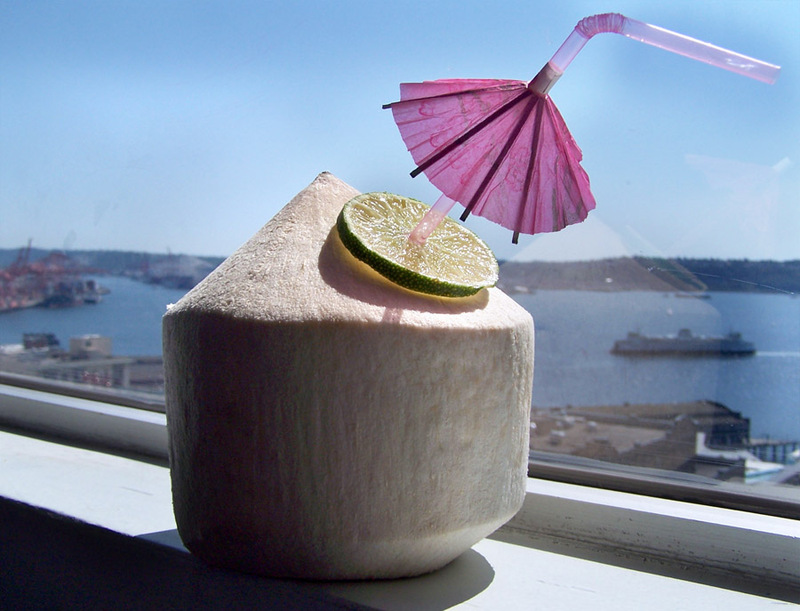 Shake all ingredients over ice, then double strain and funnel back into the coconut. Drink it through a straw. If I had done that, I would have been able to fill the coconut with ice, and it would have been a much better drinking experience for this relatively low-proof drink. Drinking out of a coconut is a lot of fun, but I regretted my choice of Clement Creole Shrub in this drink. CCS (as we say in the biz) has a very robust orange flavor, and it stomped on the relatively light coconut flavor. You would be better off with Cointreau (or similar) for this one. Categories: original creations, tiki | Tags: booze, cocktail, cocktails, coconut, coconut water, curacao, daisy, daquiri, drinking, drinks, light rum, lime, malibu, mixed drinks, orange liqueur, rum, tiki, traditional rum, wray and nephew | Permalink. A perfect vacation cocktail, or summer sipper! Do you use white rum? Do you think it would be okay if I did? looks wonderful! Any decent quality rum would be fine, it all depends on what you have available. I like Wray and Nephew because it is distilled using a pot still, in the traditional style, which gives it a funky “hogo”, which is a sulfurous, vegetal flavor similar to cachaça. For a white rum I suggest Mount Gay Eclipse Silver, although Cruzan makes an acceptable budget offering, as well. Great looking drink. Some would not call Wray & Nephew traditional. But I’m such a big fan of it. Your drink makes me thirsty! Thanks for the information. I always like learning about rum.